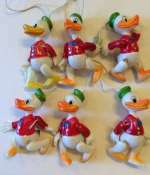 A fine group of Donald Duck celluloid figures.Disney. Ca 1940. Vintage baseball players. Sport . Celluloid. ca 1940. 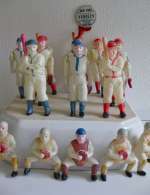 Here is a wonderful lot of Vintage Celluloid baseball players.Made of Celluloid and marked "occupied Japan. I have 16 of these..one with an attached badge "New York Yankies. Great as ornaments for Christmas or for baseball or sport collectors. Each standing figure is ca 4" (10 cm) -add a little for the ones with bats. The ones with gloves have movable arms. Good condition. Some with loose string. NOTE:The price is for one item. Discount for the group. Altes Charlie Chaplin Spielzeug in Italien hergestellt. Schönes Charlin Chaplin Spielzeug in Italien hergestellt. Wenn man auf die Figur drückt, bewegt sich die Figur. Der Hut geht auf und ab. Hergestellt aus Celluloid und Papier und gemarkt " CO Made in Italy.". Um 1950. Höhe 18 cm. Sehr gut erhalten. Antique black paper toy. Two black 3-d "Noice-maker"toy. Dresdner paper. Made in Germany ca 1900. 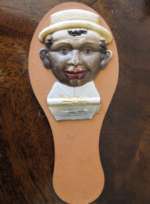 Great Antique black paper toy. Two black 3-d cracker toy. Dresdner paper. Made in Germany ca 1900. Good condition Wonderful detailed faces. High: 17 cm. Mickey Mouse Child´s dinner plate ca 1930. Disney. Comic. Old lovely Child´s dinner plate made of porcelain, marked Walt Disney Productions.1930es. Wonderful motif of Mickey Mouse.No damage. Excellent condition. Still with the old price label on. Size: D= 6 inch/15 cm. Child´s china dinner plate w. Donald Duck marked Walt Disney Productions.1930es.Comic. Childs dinner plate made of porcelain, marked Walt Disney Productions.1930es.Donald Duck,Guffy,Minnie Mouse m.fl.No damage. Exelent condition.Size: D= 6 inch/15 cm. Seaside toy from Ohio Art. Disney. Comic. Tin plate.Sand toy. Sand sifter from Ohio Art,USA. Colourful tin plate litho:Donald Duck with the family. Good condition. Minimal faded. Marked Disney 1938..Size.D= 8 inch/20 cm.. 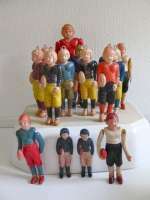 Here is a wonderful lot of Vintage CelluloidFootball players for Christmas Ornaments.Made of Celluloid and marked "occupied Japan. Great as ornaments for Christmas or for baseball or sport collectors. Most have a molded thing for hanging at the top of the hat. Each standing figure is ca 4" (10 cm)-a larger 15 cm and two small each 7,2 cm.Some have movable arms. Good condition. Some with loose string. NOTE:The price is for one item. Discount for the group.